The Toronto Argonauts signed defensive end Shawn Lemon to a contract extension through the 2018 season on Thursday. 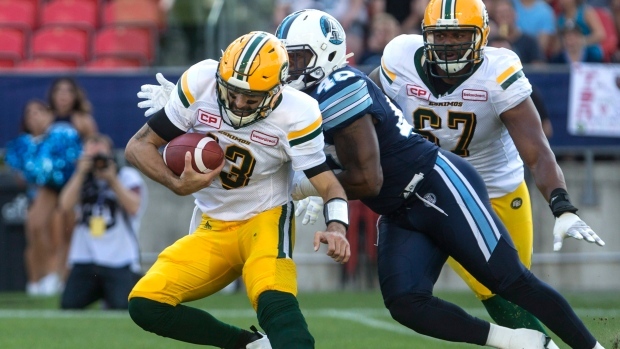 Lemon finished this season tied for second in the CFL with a career-high 14 quarterback sacks and five forced fumbles while recording 23 tackles and a fumble recovery. The Argonauts' Most Outstanding Defensive Player and East Division All-Star recorded the team’s highest single-season sack total since 2003. In 63 regular season games over six CFL seasons, the Akron product has compiled 94 tackles, 42 sacks and 17 forced fumbles. Lemon originally arrived in Toronto on July 2 via trade with the Saskatchewan Roughriders in exchange for OL Matt Sewell and QB Mitchell Gale. The Argonauts also received a conditional 2018 CFL Draft pick in the deal. The Argonauts also announced today that the club has signed linebackers Trevonti Barber and Terrance Plummer.